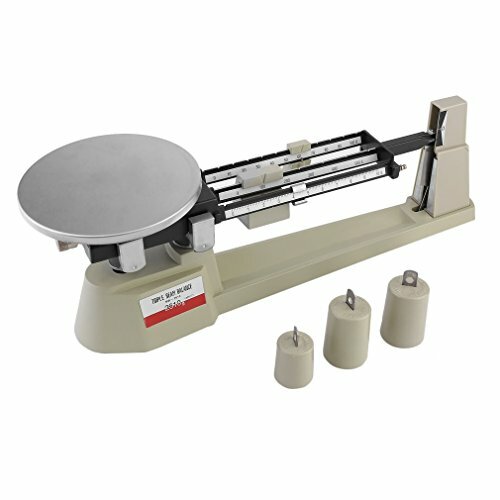 You are viewing a brand new 2610g x 0.1 Triple Beam Balance Scale at a reasonable price. 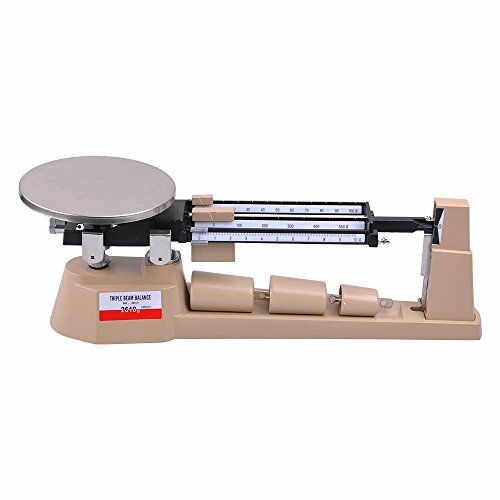 With durable aluminum alloy construction, stainless steel platform, attachment weight set and the clear reading, our traditional mechanical scale can help you to make quick and accurate weigh. Three attachment weights to increase the capacity from 610g to 2610g. 610g capacity without attachment weights. 2610 gram Max weight capacity with two 1000-gram attachment weights. The scale can hang two attachment weights at the same time. Zero adjustment knob for zeroing the scale. Built-in magnetic dampening can keep balance of the pointer after a minimum of swing for quicker results. No need battery or any other power supply. Perfect for laboratories and classrooms. Knife edges mark to make accurate and repeatable results. 6 diameter Stainless Steel Platform to place item for weigh. Come with two 1000-gram and one 500-gram attachment weights. Accurate and dependable, the original Ohaus 5-0-2 reloading scales have been the standard in bullet and shot reloading for decades. Used by hunters, competitive sport Shooters and archers since the 1960's, Ohaus reloading scales are the standard for weighing charges to reload shells, checking ammunition and arrowheads, or designing custom loads. 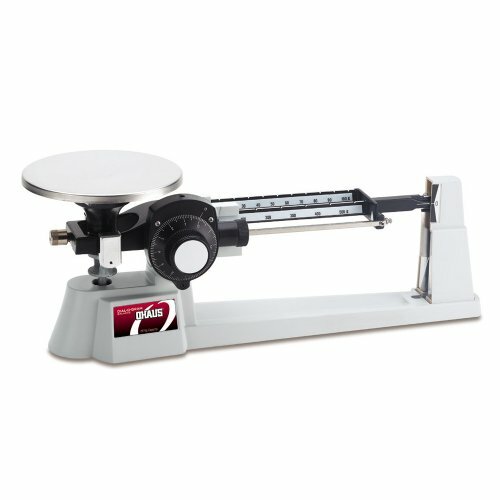 These balances offer the sensitivity and convenience of a beam balance while incorporating our original magnetic damping system to speed reloading. The Ohaus mechanical triple beam balance has a capacity of 610g and an accuracy of 0.1g (also called readability). This balance is operated by positioning the 10g, 500g, and 100g sliding weights (also called riders or poises) along the three notched, tiered beams. Magnetic damping speeds weighing, causing the beam to come to rest quickly without affecting sensitivity or accuracy, while the spring-loaded zero adjust compensator allows fine adjustments for accurate readings. The weighing platform is top loading, comes in a variety of shapes, sizes, and materials, and is easily accessible for unobstructed placement of samples. 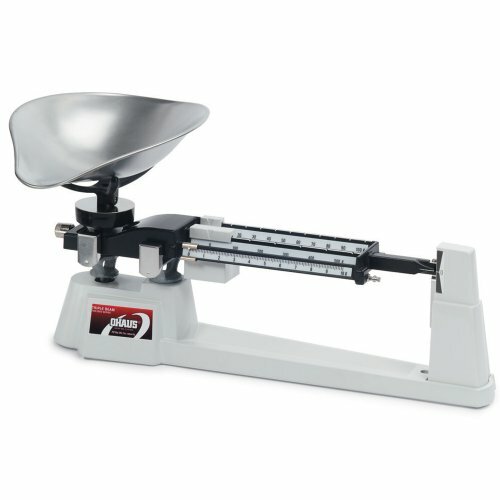 The rugged metal base and beams provide a durable foundation for use in the classroom or laboratory, and stability when weighing. This balance is manufactured to ISO 9001:2000 standards. Accurate and dependable, the original OHAUS 5-0-5 reloading scale has been the standard in bullet and shot reloading for decades. Used by hunters, competitive sport Shooters and archers since the 1960's, OHAUS reloading scales are the standard for weighing charges to reload shells, checking ammunition and arrowheads, or designing custom loads. 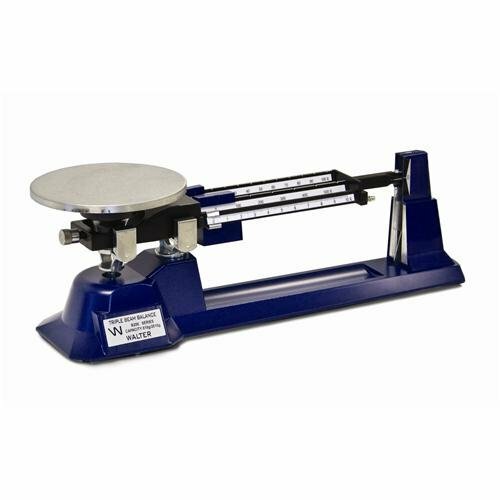 These balances offer the sensitivity and convenience of a beam balance while incorporating our original magnetic damping system to speed reloading. Our economy mechanical balances feature rugged die-cast construction, precision ground edges, dual magnetic damping system to slow oscillation, and a large stainless steel weighing platform. Capacity is 610g, and optional weight set extends capacity to 2610g. Limited five year warranty. Acrylic transparent tubular body with calibrated dual scale. Use grams for a mass activity and newtons for a force activity! Accurate and dependable, the original Ohaus 10-10 reloading scales have been the standard in bullet and shot reloading for decades. Used by hunters, competitive sport Shooters and archers since the 1960's, Ohaus reloading scales are the standard for weighing charges to reload shells, checking ammunition and arrowheads, or designing custom loads. These balances offer the sensitivity and convenience of a beam balance while incorporating our original magnetic damping system to speed reloading. Ohaus Cent-O-Gram Overhead Mechanical Balance 311g x 0.01g. Designed for use in a classroom, in a laboratory, in an intrinsically safe environment. The Cent-O-Gram Balance offers high precision and remarkable value. Everything about the Cent-O-Gram Balance ensures a high standard of quality. 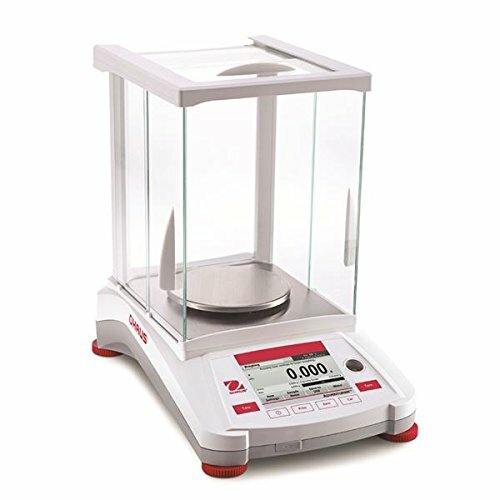 The balance offer 10 times the readability of the Ohaus Triple Beam and Dial-O-Gram top-loading balances. 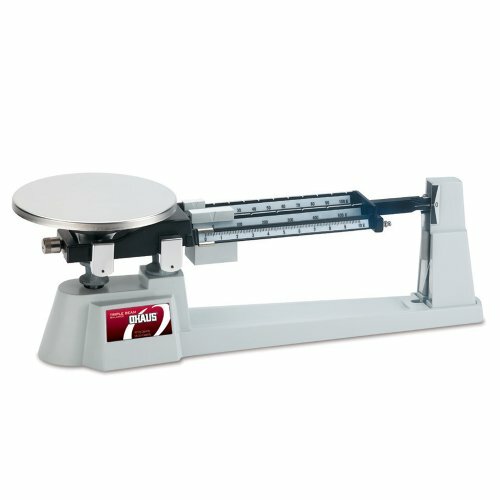 Ohaus Cent-O-Gram Overhead Balances offer the accuracy and convenience of an integrated weigh-below balance while allowing students to visualize mass measurement principles. Featuring single weighing unit and application mode. The three-point base, special floating bearing principle and beam design eliminates the need for level adjustment. Zeroing is quickly achieved by means of a zero adjust knob at the end of the beam. Notched and tiered beams for easy reading. Self-aligning with beam design and special floating agate bearings. Magnetic dampening minimizes oscillation and speeds weighing. Construction: Aluminum pressure casted base and beam, removable stainless steel pan, steel knife-edges. Weighing units: Gram. Application mode: Weighing. Capacity: 311g. Readability: 0.01g. Suspended pan size: 3.5" dia x 0.5" D. Scale dimensions: 12" W x 9" H x 18" D. Front beam calibration: 1g x 0.01g. Second beam calibration: 10g x 1g. Third beam calibration: 100g x 10g. Rear beam calibration: 200g x 100g. Color: White. Per each. Ohaus #: 311-00. 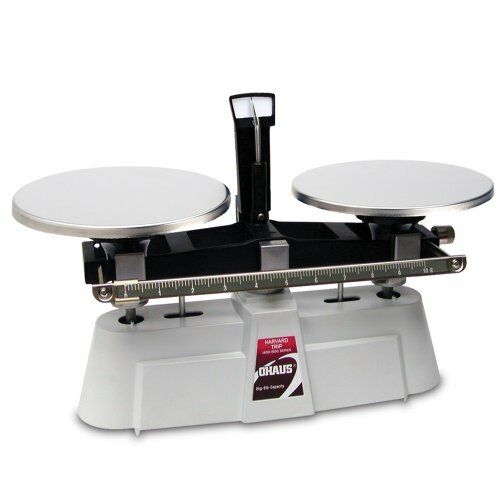 These Ohaus Triple Beam Mechanical Balances are an excellent choice for basic weighing or classroom needs. Beams are notched at weigh points and tiered with a counterbalancing knob for quick zeroing. Positive poise positioning ensures repeatable results and magnetic dampening minimizes oscillation. Balances feature a zinc metal base for stability and a low-profile design for easier access to the platform and beams. Weighing plates, pans, and bearing covers are stainless steel to prevent corrosion. All balances have a 6" (152 mm) square platform except EF1259, which comes with a 9" x 6" (229 x 152mm) box for animal weighing. Order Specific Gravity Rod and Clamp EF1255C to suspend the balance above the base of the table for specific gravity measurements. Ohaus Dial-O-Gram Top Loading Mechanical Triple Beam Balance with Stainless Steel Plate, Tare and Attachment Masses 2610g x 0.1g. Designed for use in a laboratory or classroom or industries. This classic mechanical balance is the standard by which all others are measured. Accurate and dependable, the original Ohaus Triple Beam balance has been the standard in science classrooms for decades. Whether you're weighing solids, liquids, powders or even animals, an Ohaus Triple Beam balance is well equipped to handle the job. 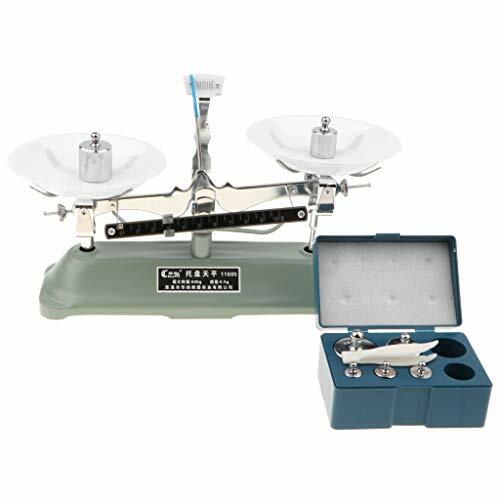 These balances offer the accuracy and convenience of a toploading balance while allowing students to gain hands-on experience through manipulation of the poises and attachment weights (sold separately), as well as to visualize mass measurement principles. The Ohaus Dial-O-Gram Series combines the convenience of direct-reading dial calibration with the speed of magnetic damping for a balance that accurately and quickly weighs everything. Featuring single weighing unit and application mode. Three times faster stability reading than any other three-beam balance on the market. The outstanding quality of the beam allows for smooth positioning of the poise, resulting in superior measurement. Notched and tiered beams for ease in reading. Positive poise positioning for repeatability. Magnetic dampening minimizes oscillation and speeds weighing. Large platform, rugged design use under adverse conditions. Also includes specific gravity weighing & spring loaded zero adjust compensator. Additional options include: Specific gravity rod and clamp, vinyl dust cover and attachment mass set. Construction: Metal base and beam, stainless steel plate. Weighing units: Gram. Application mode: Weighing. Shipping weight: 10lbs. Capacity: 2610g. Readability: 0.1g. Plate size: 6" dia. Scale dimensions: 12" W x 9" H x 18" D. Middle beam calibration: 500g x 100g. Rear beam calibration: 100g x 10g. Dial calibration: 10g x 0.1g. Tare capacity: 225g. Color: White. Per each. Ohaus #: 1650-W0. Metal base and beam, stainless steel plate. 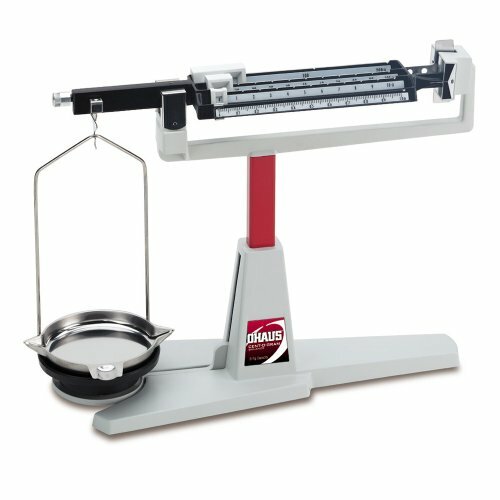 Ohaus Dial-O-Gram Top Loading Mechanical Triple Beam Balance with Stainless Steel Plate and Tare 610g x 0.1g. Designed for use in a laboratory or classroom or industries. This classic mechanical balance is the standard by which all others are measured. Accurate and dependable, the original Ohaus Triple Beam balance has been the standard in science classrooms for decades. Whether you're weighing solids, liquids, powders or even animals, an Ohaus Triple Beam balance is well equipped to handle the job. 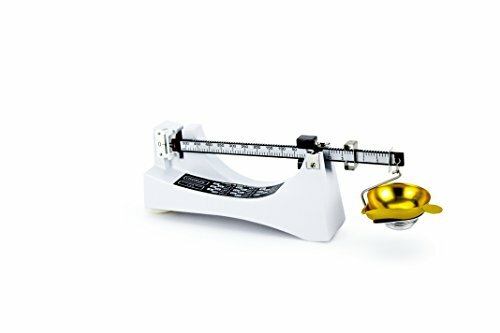 These balances offer the accuracy and convenience of a toploading balance while allowing students to gain hands-on experience through manipulation of the poises and attachment weights (sold separately), as well as to visualize mass measurement principles. The Ohaus Dial-O-Gram Series combines the convenience of direct-reading dial calibration with the speed of magnetic damping for a balance that accurately and quickly weighs everything. Featuring single weighing unit and application mode. Three times faster stability reading than any other three-beam balance on the market. The outstanding quality of the beam allows for smooth positioning of the poise, resulting in superior measurement. Notched and tiered beams for ease in reading. Positive poise positioning for repeatability. Magnetic dampening minimizes oscillation and speeds weighing. Large platform, rugged design use under adverse conditions. Also includes specific gravity weighing & spring loaded zero adjust compensator. Additional options include: Specific gravity rod and clamp, vinyl dust cover and attachment mass set. Construction: Metal base and beam, stainless steel plate. Weighing units: Gram. Application mode: Weighing. Shipping weight: 8lbs. Capacity: 610g. Capacity with accessory mass set: 2610g. Readability: 0.1g. Plate size: 6" dia. Scale dimensions: 12" W x 9" H x 18" D. Middle beam calibration: 500g x 100g. Rear beam calibration: 100g x 10g. Dial calibration: 10g x 0.1g. Tare capacity: 225g. Color: White. Per each. Ohaus #: 1650-00. Ohaus Harvard Trip Mechanical Single Beam Balance without Tare 2000g x 0.1g. Designed for use in a laboratory or classroom. Based on the classic Roberval balance principle, the Harvard Trip balance allows the determination of the difference in mass (rather than absolute value) between two objects, these balances come equipped with built-in sliding masses. 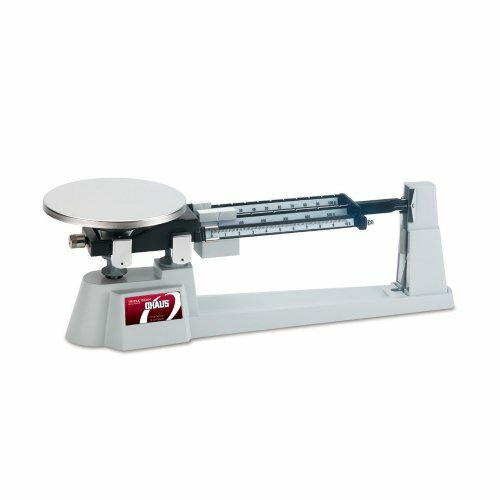 Harvard Trip balances are known for their accuracy and durability. With a two-pan design based on the classic Roberval balance principle, Ohaus Harvard Trip balances feature the additional advantages of magnetic damping, beams with sliding weights and a variety of weighing platforms. 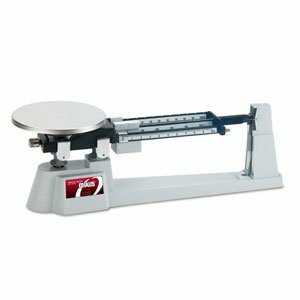 Ohaus Harvard Trip balance series are precision weighing instruments, designed to provide years of service with virtually no maintenance. Featuring single weighing unit and application mode. Angled beams and pointer are easy to read, and help reduce operator errors. Highly versatile and rugged. Special floating agate bearing, counter balancing knob provides quick zeroing and stays in position. Construction: Metal base and beam, stainless steel pan, hardened steel edges. Weighing units: Gram. Application mode: Weighing. Shipping weight: 8lbs. Capacity: 2000g. Readability: 0.1g. Pan size: 6" dia. Top beam calibration: 10g x 0.1g. Per each. Ohaus #: 1450-SD.